Kegworth Museum at Kegworth Heritage Centre01509 670137work MuseumA wide range of exhibits showing different aspects of the history of Kegworth. Displays include Victorian parlour, saddlers, local school, knitting industry, RBL war memorabilia. Exhibitions include 'Hidden Treasures of Kegworth'. A wide range of exhibits showing different aspects of the history of Kegworth. 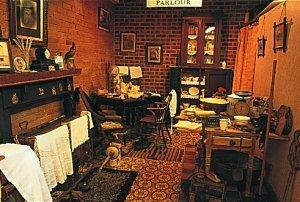 Displays include Victorian parlour, saddlers, local school, knitting industry, RBL war memorabilia. Disabled access to ground floor only. Groups by appointment. From M1 J24, A6 south into Kegworth. 2nd right into High Street, the museum is on the right. From Loughborough, A6 north into Kegworth, turn left just past the market square, the Heritage Centre is on the right.